Peter Long on Chess: What Do You Think? Its the fact of life in this so called democracy world, some votes are more equals than other...fide no exception. Russia controlled fide is almost like usa and gang controlled united nation. Good to have kasparov as president ...new person with new ideas and hopefully bring in new money to chess world. 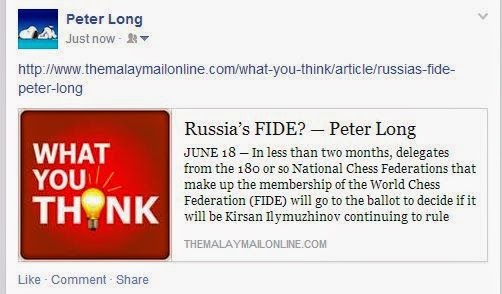 Fide needs to breath a fresh air! same goes to MCF...need new president and new management team members!!! representing Malaysia...need to pay MCF admin fee!!! what is MCF's contribution to Msian Players? with all the admin fee collected, MCF official will fly to overseas F.O.C!! !